Whether you’re a first-timer homeowner investing in lawn care tools or an experienced professional looking to upgrade your arsenal of power equipment, you likely want a lawn mower to make landscaping a faster, easier experience. With a quality lawn mower in your shed, you’ll be able to cut the grass in your yard in less time and with more accuracy, saving yourself from having to pay a professional landscaper. Lawn mowers are relatively straightforward machines. All lawn mowers have wheels, allowing you to navigate around your yard, cutting the grass as you go for a nice, even result. While their design may vary, the majority of products sold today are rotary mowers, which use an engine to produce power and spin a horizontal blade. The blade rotates at such a fast speed that it cuts through the grass as it hits it, and typically, these blades are housed within a deck, a casing that keeps grass and other objects from going flying as you operate the machine. However, there are still old-fashioned reel mowers available, which spin a vertical blade using the momentum created as you manually push or pull the device. There are many styles of lawn mowers to choose from, including riding mowers, push mowers, self-propelled mowers, and even self-operating robotic mowers. Additionally, lawn mowers can either be manual, gas-powered or electric, and electric options are broken down even further into corded and cordless designs. While most lawn mowers cost a few hundred dollars, there are budget options available for less than $100 and high-end models with price tags in the thousands—you can truly spend any amount when shopping for a lawn mower. The style and features of your pick will ultimately dictate how much you shell out when purchasing this lawn care tool, so here’s everything you need to know to make an informed decision. What to Look for In a Lawn Mower? 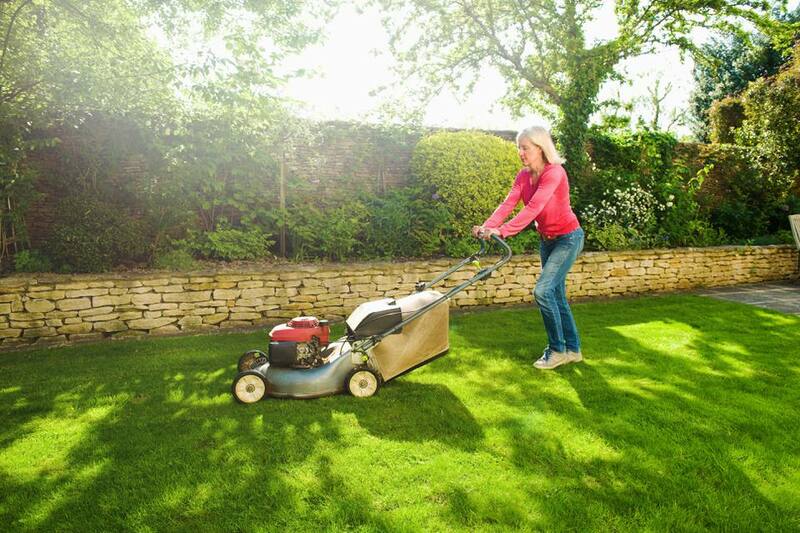 Lawn size: As a general rule of thumb, push lawn mowers are only recommended for those with yards of ½ acre or less. Any bigger than this and you’ll likely have trouble mustering up the energy to mow the whole area, as you have to push the mower around. Even with a self-propelled mower, this is a tiring task, especially during the summer! If you have more than a ½ acre of yard to mow, you’re better off with a riding mower, which you’ll sit on as you navigate around your lawn. Terrain: You’ll also want to consider the terrain of your yard when buying a lawn mower. Is it mostly flat and clear? Or are there hills and obstacles to navigate? Homeowners with small, relatively flat lawns are usually content with a standard push mower or even a reel mower, but if you have hills to navigate, a self-propelled mower can take some of the strain out of the task, as it uses the engine to power the wheels, giving you a hand when you’re on a hill. Similarly, if you have rocks, flower beds, fountains, or other lawn decorations to mow around, you may want to consider a zero-turn-radius mower, which can be steered around obstacles much more easily than a standard ride-on. Power supply As mentioned above, there are two main ways to power a lawn mower—gas and electricity—and each method has pros and cons. Gas mowers typically have more power and can easily last the full duration of your mowing sessions, but maintenance is a little more complicated and these machines often start with a pull cord, which can be tough for some people to use. On the other hand, cordless electric mowers are quieter, cleaner and easier to start, but they are generally not as powerful and can’t be run for as long per charge. Corded electric mowers give you unlimited run time, but some people find it inconvenient to have a cord trailing behind as you mow. Deck size: Deck size essentially dictates how wide the blades on your mower are—a bigger deck means bigger blades. Decks range from around 20” to 70” or larger, but most homeowners opt for a width of between 30” and 60”. Why does deck size matter? Wider decks can cut larger paths on each pass, meaning it will take less time to cut your lawn—but only if your yard is relatively flat and uniform in shape. Wider decks can cut straight paths quickly, but they make it harder to navigate around obstacles like flower beds, trees and bushes. Smaller decks are easier to maneuver, but require more passes on straight, open areas. Grass clippings: Lawn mowers can deal with cut grass in several ways. The least expensive option is to simply buy a side-discharge mower, which spits grass clippings back out onto your lawn. Many homeowners simply leave the grass clippings on their yard, as they will disintegrate and act as fertilizer, helping to cultivate a lush, beautiful covering. However, if your clippings are thick and/or clumpy, they may have the opposite effect, harming your lawn. In these situations, you’ll have to rake the clippings up, making more work for yourself. The other common option is a mower with a bagger. These machines are typically more expensive, as you have to buy a bag separately, but they save you from having to rake your yard, as they collect clippings as you go. However, if you have a large yard, keep in mind that you may need to empty the bag more than once when you mow. You’ll also have to find a way to dispose of the clipping you collect, whether you compost them or bag them up to be recycled. Attachments: If you choose a riding lawn mower, you may want one that’s compatible with various attachments, as this can greatly increase the utility of your machine. Some popular attachments (which you have to buy separately) include dump carts, rakes, lawn aerators, fertilizer spreaders, lawn rollers, and more. What Is the Best Type of Lawn Mower for Me? Riding lawn mowers are popular among homeowners will big yards, as they allow you to sit on top of the machine, driving it around with a steering wheel. You may also see variations of riding lawn mowers that you steer with a lap bar instead of a wheel. This style of lawn mower makes it easy and effortless to cut large areas of grass, but they are bigger and therefore harder to store. Not to mention, riding lawn mowers are more expensive than other styles, starting at $1,000 and topping out around $3,000. On the other hand, there are push mowers, which require more manual effort on your part. This style of lawn mower requires you to push it around the yard, using your muscles to create enough momentum cut through tall grass—a draining task in the summer, especially if your yard is on the bigger side. Push mowers are smaller and significantly less expensive than riding mowers, generally costing between $100 and $400. These machines look similar to push mowers, but they require less manpower to operate. Self-propelled lawn mowers use power from the engine to turn the wheels—kind of like in your car—which means you don’t have to push them around the lawn. Instead, you merely guide them as they do the heavy lifting. Self-propelled mowers, which typically cost between $300 and $900, are extremely beneficial if you have a sloped yard or more area to cover, and they tend to result in a more even cut, as you’re not jerking them around. However, you don’t have as much control over the speed as you do with standard push mowers. Electric lawn mowers are powered by electricity instead of gas. They come in both cordless and corded styles, and while the majority are push mowers, there are also some self-propelled and riding options available. Some people prefer electric lawn mowers because they create less pollution and are typically quieter than gas models. Plus, they are generally easier to start, using a push-button instead of a pull cord. The downside of electric lawn mowers is that they are less powerful than gas mowers and may not be able to complete a full cut on one charge if your yard is large and you have a cordless mower. Electric push mowers usually cost between $100 and $200, but self-propelled or riding options can range up to $1,000 or more. Zero-turn radius lawn mowers, also called ZTR mowers, make navigating around your yard a breeze. This type of ride-on machine has front caster wheels that pivot at sharper angles, making it quick and easy to take turns and trim around obstacles in your yard. This advanced feature makes these mowers more expensive—they typically cost $2,000 or more. People typically think of reel lawn mowers as old-fashioned lawn mowers. These machines use a vertical blade that spins north-to-south, and unlike most mowers today, they generally do not have a motor. Instead, the momentum you create while pushing the machine causes the blade to spin. Reel mowers are only practical for those with very small lawns, as they require a hefty amount of manpower to operate. However, the plus side is that these are one of the least expensive lawn mower styles, costing less than $100. One of the up-and-coming styles of lawn mowers is the robotic or “smart” mower, which lets you mow your yard without lifting a finger. Once you set up a perimeter wire around the area you want to be mowed a robotic lawn mower will do the job all on its own, so you can just sit back and watch. Many robotic mowers can be monitored or scheduled via your smartphone, and they’re a lot quieter than gas mowers, as they run on electricity. Like any new technology, there are downsides to this type of lawn mower. For one, you have to set up the perimeter wire, and most robotic models can’t navigate uneven terrain or extreme slopes. Additionally, you’ll want to make sure your yard is free from sticks or other obstacles that could potentially damage your machine, so it’s not a completely hands-off experience. Depending on the size and capabilities of your robotic mower, it could cost anywhere from $600 to $2,000. Honda: Honda is known for its quality push and self-propelled lawn mowers, which are typically on the higher end of the price spectrum. These lawn mowers are known for their durability and performance, as they’re equipped with great engines and twin blades for a more precise cut. Today, you can find this brand at most big-name home improvement stores. Toro: Toro makes ZTR mowers, as well as push and self-propelled models. Their machines are specially designed to cut wide paths, making your job quicker, and many models have helpful features like adjustable walking speeds, upright storage, and electric start buttons. The majority of their ride-on mowers feature lap bar steering, and you can find this brand at Home Depot. John Deere: Perhaps one of the best-known lawn mower brands is John Deere, which has been around since the mid-1800s. The company offers both residential and commercial mowers that are known for their performance, cut quality, and various grass handling options. There are ample attachments available for this brand, and you can find these products at Lowe’s. Husqvarna: Husqvarna offers a wide variety of high-end lawn care tools, including most all styles of lawn mowers. Whether you’re looking for a ZTR, standard ride-on, self-propelled or push mower, you’re sure to find a top-tier Husqvarna model that’s easy to use and built to last. This brand is on the more expensive side, and you can find its products at Lowe’s or Home Depot. Craftsman: Another lawn mower brand is Craftsman, and you can find their products at Ace Hardware. This brand makes push, self-propelled and riding mowers, and it has a positive reputation as a maker of both tools and lawn equipment. There are a variety of accessories available to add additional functionality to your lawn mower. Perhaps the most common accessory is a bagger that will capture grass clippings as you mow your lawn. These are available for both walk-behind and ride-on mowers, and they can make your life a lot easier if you don’t want to leave the clippings strewn about your yard. Unless you’re skilled at fixing power equipment, you’ll likely want a warranty to protect your new lawn mower. Most manufacturers offer limited warranties for a set number of years—typically around 4 to 5—or a certain number of hours. However, these warranties only cover defects in material or workmanship under normal use and maintenance. Depending on where you purchase your new lawn mower, you may be able to purchase an additional protection plan for an added fee. For instance, Home Depot offers a 3-year protection plan that covers failures due to power surges, dust, heat, mechanical defects and more. If you’re typically rough on your machinery, this type of additional coverage may be a sound investment.